TEMPORAL REGIONALISM | gURROO - A new generation of innovative minds. 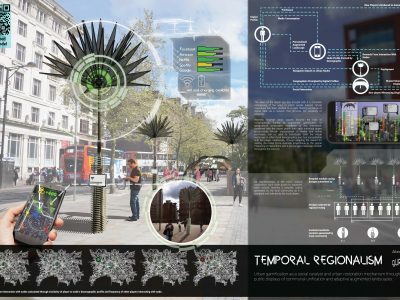 Urban gamification as social catalyst and urban restoration mechanism through public displays of temporal regionalism and adaptive augmented landscapes. The dawn of the digital age has brought with it a complete reimagining of the ways in which people interact. Social experience has been distilled to a rapid, fleeting exchange of digital data via a network that removes the necessity of proximity. 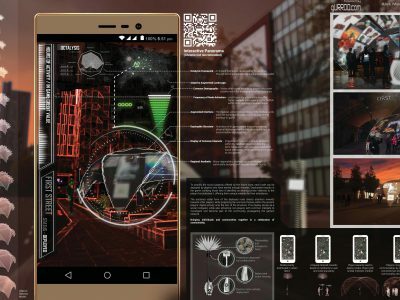 Recently however urban spaces became the host of congregations thanks to augmented gamification of geographical landscapes. 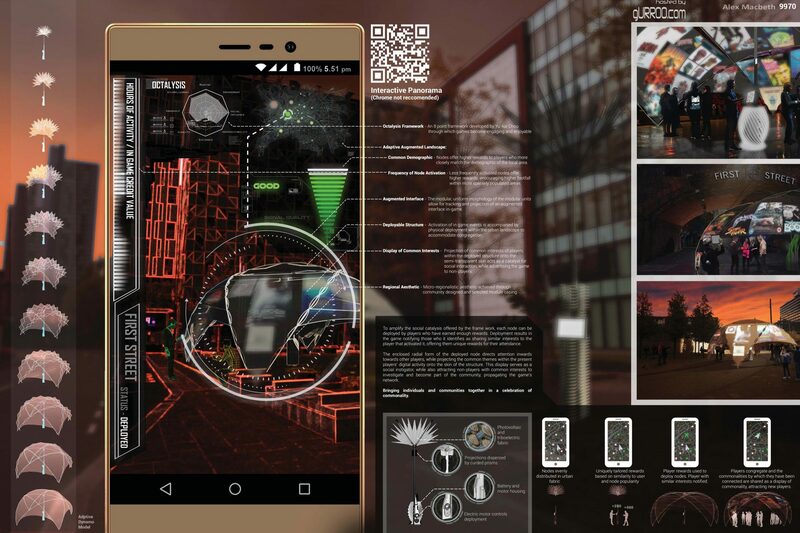 Adaptation of this framework, combined with the digital profile data each individual player accumulates though consumption of media and online purchases, can be used to individually tailor the virtual landscape to reflect local demographics and their compatibility with the player. Additionally, through adapting the reward for visiting the nodes to be inversely proportional to the typical frequency of interactions with it encourages more even footfall throughout the network. 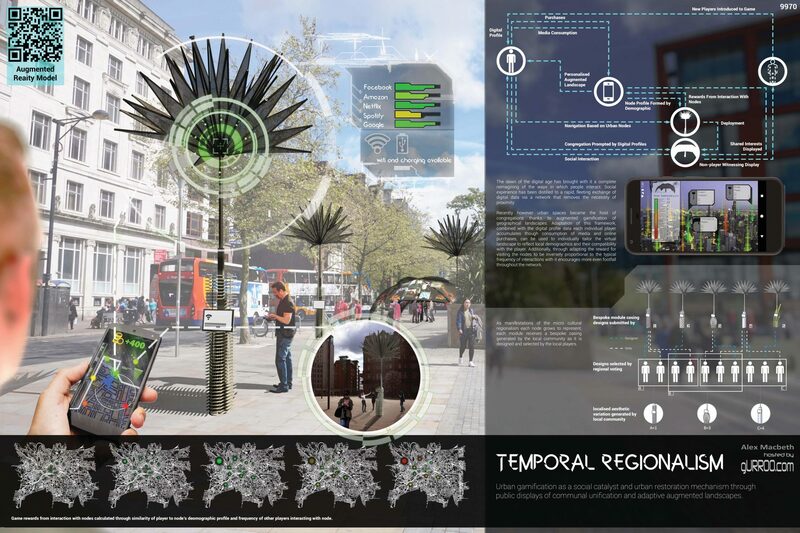 As manifestations of the micro cultural regionalism each node grows to represent, each module receives a bespoke casing generated by the local community as it is designed and selected by the local players. To amplify the social catalysis offered by the frame work, each node can be deployed by players who have earned enough rewards. Deployment results in the game notifying those who it identifies as sharing similar interests to the player that activated it, offering them unique rewards for their attendance. The enclosed radial form of the deployed node directs attention inwards towards other players, while projecting the common themes within the present players’ digital activity onto the skin of the structure. This display serves as a social instigator, while also attracting non-players with common interests to investigate and become part of the community, propagating the game’s network. Bringing individuals and communities together in a celebration of commonality.